BBC NEWS | Have Your Say | Is Britain's immigration system working? Tony Blair has joined several of his ministers and senior security officials at Number Ten, for talks on the state of the UK's immigration system. The meeting was arranged to try to find ways of stopping people abusing the system, and to restore public confidence after the resignation of the immigration minister, Beverley Hughes. Ms Hughes stepped down last week after it emerged that she had known about claims of a visa scam operating out of eastern Europe. However, the Tories have described it as another "headline grabbing stunt". What do you think? Is the nation's immigration system working? Will the summit make a difference? The high level of immigration into the UK has, and is, dramatically and irreversibly changing the make up of our country. I personally don't know enough about all the issues involved to say if this is a good or a bad thing, but what really concerns me is the fact that the general public has never been consulted on this matter. The government has been panicked into these measures by an ugly agenda pushed by the right-wing tabloids that is at best xenophobic and at worst racist. There is not a crisis in immigration, though there is in pensions, Iraq, child protection, the environment etc, etc. Why do the tabloids (and therefore the government it seems) not focus on these real issues? Concessions should not be made to bigots. The government likes to pretend that the next election will be fought on domestic issues such as health and education. I think immigration and Iraq will feature heavily, and I don't believe the government will do anything about it, other than meaningless inquiries and initiatives. Yes, there's an election coming. Feel the wind blowing Tony? I did temporary work for the immigration department of the Home Office about 2 years ago, and quite frankly it was a shambles. The backlog of incoming post was phenomenal and no-one at manager level seemed really to care about it. It is unbelievably easy for immigrants to 'disappear' and slip through the cracks of those being checked in each week, as is the procedure. In my opinion, the government should put more money into the control and overseeing of those coming into the country in order that this does not continue to happen. We are constantly being told that we need more immigrants to fill jobs which the indigenous populations either do not want to do are not qualified to do. Yet we have so many people unemployed. Would it not be better to concentrate resources in training people already resident in the UK and cutting benefits so that people would be more willing to take on the less desirable jobs? Why are we not training the unemployed of this country? If we are lacking in skills so we have to allow importation of labour then why are we not training the unemployed of this country to fill the gap? We hear a lot of comment about how the European Community and unfettered world trade will bring increased prosperity to us all. In reality it will simply allow trans-national companies to move capital around the world at the click of a mouse button, and to create or destroy jobs at will. If you subscribe to the capitalist system, then what's so very wrong with workers taking their labour around the globe too? The UK already has a shortage of housing. The current house prices reflect this and the council waiting list in my area is 70 years. How are we to house immigrants? On the wages they are likely to be paid they will not be able to afford to buy plus the banks are unlikely to consider a mortgage on someone entering the country. This means they will rely on council properties thus penalising people already on the waiting list! Having worked in both a benefits office and with asylum seekers and refugees I feel that I have a fair overview of the situation. Where there is any kind of system, there will be abuse by a few regardless of their nationality. Most asylum seekers I have met have been treated abysmally in their own countries and are stigmatised and treated as less than human by the UK system and its officials. It makes me ashamed to be British when I read the ignorance of some of the comments on boards such as this and some of the editorials written by educated people who should know better. People should realise that immigration is a two way process. My parents- in-law have, like many others, moved to Spain where they are making full use of their health system. Quite rightly no-one is up in arms about hoards of British pensioners taking advantage of the Spanish welfare system. This leads me to the conclusion that concerns over immigration are largely based on, at worst, racisms and, at best, a fear of change. Whether the immigration system is working or not is clearly irrelevant, judging by the shocking amount of ignorance on this issue displayed by most of the media. The NHS is not groaning under the weight of immigrants, it is built on them. We don't have a shortage of affordable housing because of immigrants or asylum seekers but because developers don't want to build cheap houses. We are not being 'swamped' and any look at the real statistics will show this. Let's get this into proportion and start having a proper debate instead of treating this as a political football. We are told that immigration will solve a lot of shortages ranging from skills in the workplace to future pension fund contributions. The evidence however suggests that in the UK all that happens is services become congested and oversubscribed by unskilled immigrants and dependents, space is used up, tensions rise and existing skill sources, from existing citizens, are undeveloped. Politicians keep making short term decisions that have long term damaging implications. If we should close our borders as suggestion by some of your readers, perhaps that should be both in and out. I'm sure the many Spanish and French villages being bought up by Brits resulting in the increase of property prices beyond the reach of locals would be delighted!! People should remember we are dealing with human beings only in search of a decent living... and not just buying a piece of sunshine as a luxury like many Brits!! Ignoring the usual bigoted xenophobic claptrap surrounding immigration, we now hear that Britain needs large numbers of immigrants to do low paid work - "hospitality", cleaning in the NHS, fruit and vegetable picking etc. Hasn't this been tried before - I seem to remember being taught about the slave trade at school? The real problem is that millions of potentially productive UK citizens are allowed to rot on incapacity benefit, with the resultant tax burden falling on ordinary working people. Meanwhile the 'fat cats" benefit from low wage costs and avoid taxation. Blair just doesn't get it! Listen loud and clear Mr Blair - it is the sheer numbers your government is allowing in that is alarming people, not just abuse of the system as you claim! With the cost of housing so high I wonder where all these new immigrants will live. I can see the Green Belt being torn up in order to build low-cost housing. And isn't the NHS already groaning at the seams? It is not the system that is to blame but the avoidance of its use as expediency. Surely the answer is to admit no one unless they are duly processed. Improve the system, yes. But don't throw open the doors in the meantime. The system has collapsed!! They need to shut the gates now, let no more in, unless of a decent profession. Here we go again, Blairspeak and waffle. A clear case of letting little boys try to do men's jobs. Sack the whole sorry lot!! The government's own social exclusion unit has just reported that there are 4.5 million people of working age living in households where no one is in work (page 14 taking stock and looking to the future). We need education not uncontrolled immigration. As far as asylum seekers are concerned the answer should be 'no' to all requests. Britain is an island, surrounded by safe countries, therefore anyone claiming asylum here has failed to comply with the rule requiring them to claim asylum in the first safe country they come to. Managed immigration - yes. Asylum seekers - no. The home office has got all its priorities wrong. British University educated students that pay fees in excess of £7000 are treated appallingly. Yet the ones who come here with no skills and nothing to offer are given the red carpet treatment. Its insane. Ageing population. Won't the immigrant population age too, or do we solve that by inviting yet more immigrants? Don't leave to tomorrow what you should sort out today! Britain is a large country and a young country and I feel we should be eager to accept newcomers as long as they have talents and skills. We need settlers in this country to send a message of welcome out to others who wish to contribute! Our pensioners need to have people paying into the system! Let's get practical, we need the right people with the right skills, not just anyone, as other countries aim to achieve. Also, do we really need so much immigration? I earn a decent salary (I think) but can't afford a home. Surely more people will lead to higher prices as housing supply falls further or massive destruction of our green and pleasant land? Why do I need more people to pay my pension, its private anyway!!! Having sponsored someone, I have first hand experience of UK visa officers in Africa being rude and obstructive in an attempt to thwart applications. 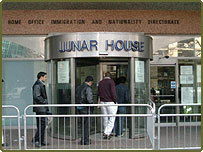 In the UK, once you actually get in, the visa officers at Lunar house have been efficient and helpful. Waving through large numbers of immigrants without proper checks is not fair on: those who struggle hard to get here legally despite the pressures and contribute or on UK citizens who pay taxes. This country needs skills in many sectors. We need a consistent policy that can welcome and train those who will add value to our society in the many sectors where they are needed. Whilst uncontrolled migration would be absolute anarchy, it is very heartening to see that so many have more faith in the future of this country than we do. When we hear about jobs in call-centres being offshored and we are wondering if it is the thin end of the wedge, people still want to come here to make the most of the enterprise culture that we have. We should also be making more of the opportunities Britain has to offer. Stop worrying about the jobs that have gone, think about the ones you can replace them with, they'll be a lot more exciting. We live just down the road from Lunar House, shown in your picture and as a result we have a massive number of immigrants right on our doorstep. If people living in other parts of the country think they have a problem they should try living in Croydon. All the surrounding services such as education, health and the police service are under great pressure as a result and those who live here find that they are unable to obtain the services they need. Tony Blair is aware of the problems that his actions have caused and many people who work at Lunar House and locally are aware of the damage his government is causing because of its lack of ability to keep a tight control on this problem. What needs to happen is there needs to be a complete overhaul of the system. It needs to be taken away from the Home Office and made completely independent. Once it is completely independent, it must be free from political interference and skulduggery. The people who work in the organisation must completely abide by an internal mode of conduct and there must be a means of airing grievances without recriminations. This is realistically the only way that the UK will be able to get a handle on its immigration system. The indigenous UK population has little or no access to affordable housing. Until our politicians recognise and address this problem the immigration issue will not go away. Britain needs to re-train its workforce in areas of skill shortages. Simply importing immigrants to fill vacancies is not the answer. Whilst I am liberal and expect everyone to get a chance, where are we going to put all these people who come to the UK? We are physically running out of space. The roads are severely congested and you claim there is a housing problem, so every piece of greenery is being used for building yet more homes - enough is enough. I've lived and worked in the UK for 30 years as an immigrant and the immigration system is still a nightmare. The apathy and incompetence of the Home Office is appalling. Add to this the now huge numbers of bogus asylum seekers, who vastly outnumber genuine asylum seekers, and the system is collapsing. I used to be able to renew my resident visa in 5 minutes at the airport immigration desk for free. Now it costs £240 to get a stamp put in my passport, and the Home Office holds my passport for up to a year, meaning I can't travel for holidays or business. It's ludicrous. We need more immigration, not less. I need a dynamic workforce to pay my pension when I retire in thirty years - there won't be one without that. This is a frenzy of thinly-veiled racism among people who probably have never seen an immigrant. I live in an area of London that has seen a lot of Slavic immigration recently and it's great. I think a more relevant question is, does any country's immigration system work as intended? Even Australia, whose procedures were lauded by an earlier contributor, has plenty of illegal immigration, and Australia is an island hundreds of miles from anywhere. It is time to face reality - immigration cannot be turned on and off like a tap. The economic and social forces driving it are irresistible. If the system was working there would be no need for an emergency summit. But it isn't and people have had enough. Time to say - sorry, full up for now, please try later. Half of the developers at the software firm where I work are from Eastern Europe or China. Their goal is to send as much money home as they can, so they spend as little as possible while they are here (most of them quite unabashedly drive untaxed, uninsured, un MOTd cars, for example). Meanwhile, the UK IT graduates that I know who graduated last year are seeing their skills stagnate while they flip burgers or do low paid temp work because they can't break into their field. Is this what we mean by having a flexible economy? To Mark from Birmingham, I am a software consultant myself and came here from India. Yes I accept I work more hours, earn more money and send it back home. I don't spend more than my earnings on designer cloths and holidays. So what's wrong in that? I pay my full tax and national insurance here, unlike local IT contractors who don't pay any tax and evade tax by setting up offshore accounts etc. And when they are out of a job, they claim eco benefits from the government which we are not entitled to even though we pay more tax. With regard to driving without tax, insurance, I can show you more locals who do that than the foreigners. So please don't liken these things with immigration. System? What system? It's complete chaos. A few years ago, friends of mine decided to emigrate to Australia. The process took weeks, involving interviews to determine suitability for immigration (despite my friends being professionally qualified as a pharmacist and a teacher) and checks to ensure they had sufficient funds. If Britain was half as thorough as Australia in dealing with applications (and allowing in people without prior successful applications only in a dire emergency) we wouldn't be in the situation we're in now. While I believe in a strong, fair and restrictive immigration policy I also believe we should actively support the development of the countries and regions from which these people wish to escape, thus removing the motive. Along with this, the migration of skilled people such as doctors and nurses from the developing world to the UK is nothing more than theft! It has been in crisis for a long time, and both Labour and the Tories have used 'Headline grabbing stunts' rather than actually tackling the crisis. Even allowing for some exaggerations, the press has exposed a number of abuses over the years, and yet ministers have done nothing to resolve the problems. The current influx is not directly affecting the elite, so they seem oblivious. At the lower end, it is causing problems with education, housing and health, and this needs addressing urgently. As regards 'Will the summit make a difference?' Well, do pigs fly? The very people who administrate the immigration system have warned us that it's not working, and who should know better than they do? The sad fact is that the UK has now completely lost control of its borders. It's not like this is some brand new phenomenon - the news media have been printing articles about it for years but the government has done nothing to stop it beyond token gestures. One thing is for certain, the issue of immigration is going to be high on the political agenda at the next general election. That's the only reason that Tony Blair is holding this so-called "emergency summit". While I have nothing against people who want to come to the UK to become a productive part of society, I believe we need to close the borders for now, until we can properly sort out our control systems. It will probably only take a year, but until we clear our backlog and see where we stand, we will continue to be taken advantage of. The system isn't working because the way it works now and the purpose of it all is completely opaque to the UK population. If no-one knows how or why immigration occurs then there is only fear and confusion. By the end of this week, possibly the end of today, there will be new initiatives, headlines, a taskforce, inquiries (internal of course) and anyone with a short memory will be convinced that the government is on top of this mess that they created. Those who still remember last week will know that it will all be show and nothing concrete will have been achieved - again. I don't think there is anything wrong with CONTROLLED immigration. In other words either genuine refugees or people with skills which we lack as a country. Both have a positive and desirable contribution to make. But this government has totally lost the plot and has no idea who is coming in or going out of the country. The negative side is that it turns the population against these incomers and creates resentment. These feelings should be directed instead at bringing Tony and co to book.